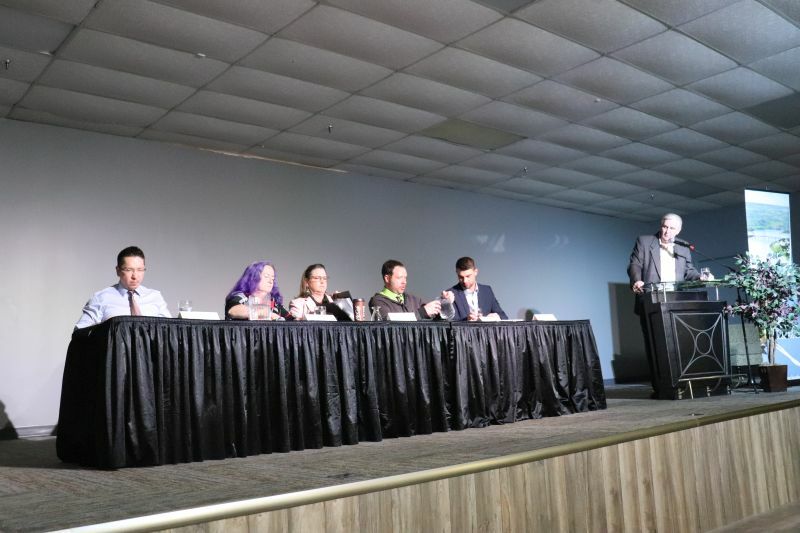 All five party candidates in the Peace River constituency squared off for the first time at the Peace River forum on Monday evening. The forum was hosted by the Peace River and District Chamber of Commerce and moderated by Randy Hodgkinson of Community Futures. The Peace River forum focused largely on economic topics, including the deficit, pipelines and the much-maligned carbon tax. Liberal candidate Remi Tardif outlined his party’s unique economic plan to eliminate income taxes entirely for a portion of the population, and instead bring in an HST in order to help Alberta diversify away from oil revenue. “The Alberta Liberal Party projects a big chunk of money in corporate welfare, about 500 million that could be amassed and brought back to the public service. Plus having an HST would tax people from other provinces and give us another billion,” Tardif said. Freedom Conservative Party candidate Connie Russell stated several times that her party would stop equalization payments to the east in order to keep more money in the province. The federal carbon tax kicked in at the beginning of April for other provinces that did not institute their own carbon tax including Ontario, Manitoba, Saskatchewan, and New Brunswick. According to reports by the *Canadian Press*, the federal tax is $20 a tonne for 2019 and will increase by $10 annually until reaching $50 a tonne in April 2022. Meanwhile, the Alberta carbon tax also started at $20 per tonne in 2017, increasing to $30 a tonne the following year, but it has not been raised since due to the lack of approval for the Trans Mountain pipeline. To date the Alberta government estimates it generated $2.6 billion in revenue by the end of March, which is separate from another $899 million brought in under a separate carbon pricing system for large-scale industrial emitters first instituted by a previous Progressive Conservative government under Ed Stelmach. Williams said the tax had not and would not reduce carbon usage. “I’m going to keep using it to heat my home and drive my car no matter how much they do that because that’s what I need to do, I live in the north of Alberta,” he said. NDP candidate Debbie Jabbour pointed out that the NDP had passed legislation to do just that, but preferred to collaborate before actually enacting it. FCP candidate Connie Russell told the crowd to go home and check out the UCP policy on the tax, saying the party would actually be to keep two thirds of the carbon tax, and only her party would truly scrap it. Russell also stated that Albertans had been lied to about climate change when answering a separate question. Perhaps the most contentious question of the forum came down to a question UCP candidate Dan Williams asked in his opening statement. Williams was echoing similar questions posed by UCP leader Jason Kenney. When Kenney asked the same question, he inadvertently sparked Twitter users to hashtag #betteroffwithrachel in response, a hashtag that then trended nationally in Canada with hundreds of Tweeted responses. However, she was interrupted by loud noise from a portion of the audience, the only outburst of the evening that had to be brought back under control by the moderator. House said his party would instead use innovative ideas like pucks to ship oil to avoid the issue of pipeline spills. “I hope everyone is going to get out and vote and please be informed. And don’t vote out of fear. Vote because you want a future for your children, for your grandchildren and a future for Alberta that’s positive. A future that is growing that is healthy that takes care of its most vulnerable and that takes care of human rights,” Jabbour said. Advanced polls are now open. A record-breaking 140,000 people voted on the first day of advance polling in Alberta.